Against all odds, the mayhem-packed tragedy of Jeffrey Lee Pierce is told by his long-suffering band-mates. Kris Needs listens and weeps. 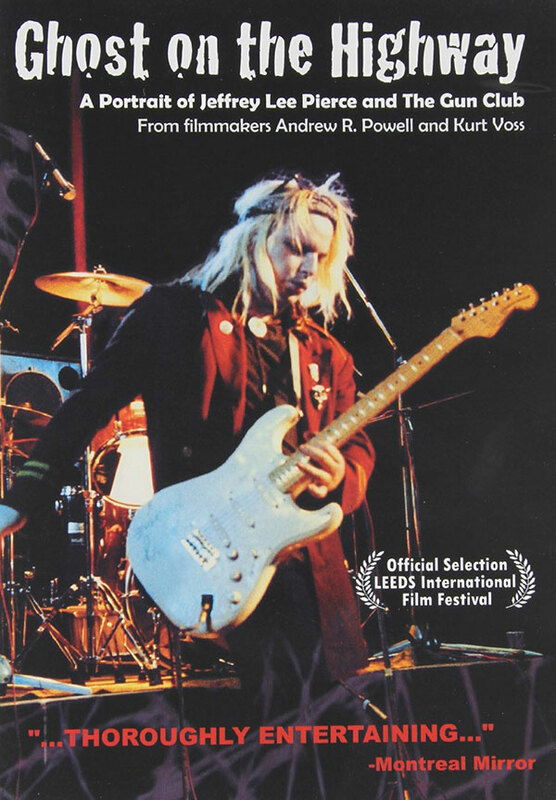 There’s never been a proper documentary about the Gun Club, the apocalyptic punk-blues death party started in late-70s Los Angeles by Jeffrey Lee Pierce, who suffered a fatal brain haemorrhage in 1996 at the age of 37. Ghost On The Highway holds no pretensions to be the ultimate record. Director and long-time fan Kurt Voss, converted after witnessing Pierce get a kicking while supporting the Cramps in 1981, unashamedly believes that the group, particularly their doomed leader, are, ‘still in much need of more myth-making…My goal is to proselytize and leave the autopsy report stuff for later’. This he achieves as band members and friends relate the often harrowing story of the phenomenal talent who exploded into the world with 1981’s seminal Fire Of Love album before embarking on a lifelong drugs ‘n’ booze-fuelled career kamikaze, though still managing to create incandescent masterworks like Miami, The Las Vegas Story and Mother Juno. Pierce’s savagely-haunting confessionals and narcotic love songs explored America’s dark underbelly hotwired to the eternal artery of the blues. A hopeless romantic, when sober he was an endearingly-passionate sweetheart obsessed with William Burroughs, Blondie and free jazz. Drunk he became a belligerent nightmare, prompting the wrong Jim Morrison comparisons. Former collaborators Kid Congo Powers, Ward Dotson, Terry Graham, Jim Duckworth and Dee Pop tell their leader’s story with rueful humour, exasperated anger or sometimes tears. Their disparate characters engage throughout the 98 minutes, particularly lifelong friend and Gun Club mainstay Powers, who Pierce taught to play guitar, and long-suffering drummer Graham, who confesses, ‘There were many years I had this recurring dream of hitting him in the face with a golf club’. Over a quarter-century later they smile grimly, even disbelievingly, through tales of wilfully antagonistic gigs, cowardly dismissals and missing money, incredulous that Pierce managed to demolish three Gun Club lineups which could have gone on to much greater things, although still remembering other nights when magic happened. Light relief occasionally pokes through the foot-shooting: Pierce’s Debbie Harry obsession, marked by his peroxide tresses, was consumated after he hid himself in a shopping trolley to sneak into Blondie’s L.A. hotel in early 1977, earning his appointment as their fan club president. He found solace living in London in the mid-to-late 80s with new partner Romi Mori, adopting her native Japan as his spiritual home [his ashes scattered in Kyoto in 2006]. But it didn’t last and the home stretch of Pierce’s final disintegration is shockingly sad, especially for Kid Congo. True to the infernal spirit of the Gun Club, Voss’s self-financed ‘love letter’ ran into trouble. After lengthy negotiations with Pierce’s estate to use the first two albums, it emerged he’d sold the rights in 1982 to a company that had just been taken over. By now, Voss had drained his resources, completing the film with benevolent editor Andrew Powell co-producing and nothing left for music. Surprisingly, once accepted this doesn’t seem to matter, the movie telling the story compulsively enough to develop its own engrossing flow [although puzzlingly interrupted midway by Lemmy growling about the music business!]. Henry Rollins, who published Pierce’s autobiography, hails him as ‘totally legendary now’. That the movie can explain why with such limited means is testimony to its success.